The Accufast P8 is ideal either as a stand alone printer with the ACCUFAST HDF Feeder or as a print module at the end of an inserter. The Accufast P8 features two banks of 4 print cartridges each (that’s where the 8 comes from) to give a full 4 inches of print. Each imager can be positioned over a 14 inch print path and controlled by either including print manager software or a Vista compliant Print Driver. 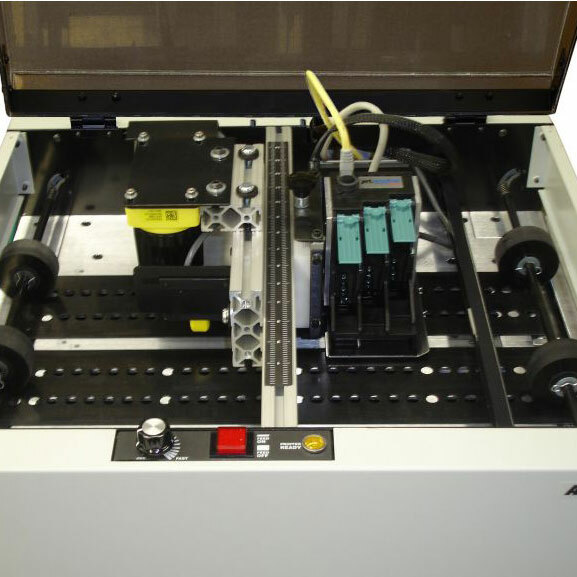 Imagers may be individually positioned vertically to give improved print quality on uneven materials. Material is transported through the P8 by a vacuum belt system at speeds up to 100 inches per second. Pieces over .250 inch thick may be successfully run. The P8 includes an I/O port that allows signals generated in the printer to be sent to input or output devices that are running in line with the printer (think mail sorting).